Van Honsebrouck is a Belgian brewery in Ingelmunster, Belgium. Founded in 1865 as Sint-Jozef Brewery, it was renamed to Brewery Van Honsebrouck in 1953. It is one of two breweries outside of Pajottenland to produce lambic beer. “On 1st January 2009, at the ripe old age of 79, Luc Van Honsebrouck passed on the mashing stick to his son Xavier (born 1967). By that time, Xavier had been working within the brewery for over 20 years, primarily in sales and exports and then gradually taking over management duties from his father. Times have changed. 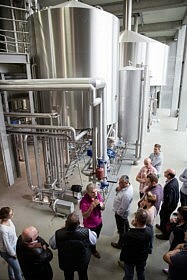 When “mister Luc” was in charge of the brewery, visiting journalists were received by the brewmaster or a member of the marketing team. Only at the end of the tour would Luc make an appearance in the tasting room to offer a round. These days it is Xavier himself who welcomes the guests, makes a pot of coffee and pours the beer. The founder of the Van Honsebrouck brewing dynasty was Amandus (1811 – 1865). 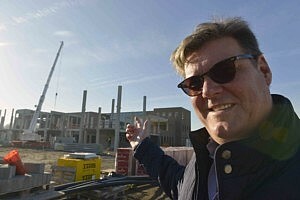 He was the mayor of the village of Werken, where he owned a farm that included a dairy, a brewery and a distillery. Amandus passed away suddenly and was succeeded by his son Emile (1844 – 1929) as both brewer and mayor (until 1878). In 1863 Emile married Louise De Poorter, who came from Ingelmunster. The young couple moved into the family farm in Werken. However, Louise did not get on with her mother-in-law and the grandchildren were not warmly welcomed. Emile and Louise left the village of Werken to start up their own breweries, first in Vichte, then in Kortrijk. Neither venture was a success. In 1900 the Van Honsebrouck – De Poorters moved into a modest farm on the outskirts of Ingelmunster and the little Sint Jozef brewery was born. Emile was not cut out to be in charge of a brewery, and so Louise found herself looking after the beer as well as a household with five children. In 1922, when Emile was pushing 80, ‘merke’ – as Louise’s children called her – entrusted the brewery to her son Paul. He took up the mashing stick jointly with Ernest, his older brother. Together, the brothers managed to keep the brewery going after the destruction wrought by the First World War. Ernest belittled his own brewing skills: “I was taught how to brew by my brother Paul, who learnt from ‘our’ Dad, who couldn’t really do it either!” Nevertheless, the pair successfully expanded the brewery in 1930. 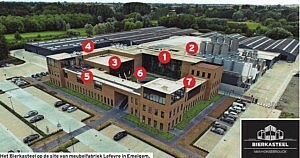 A new four-storey building was added, comprising a maltings, water basins and storage facilities for barley. The ground floor was used for the great storage barrels: 15 foeders with a capacity of between 18,000 and 25,000 hectolitres each. The renovation concluded in 1939 with the addition of a new brewing hall, tank hall and bottling plant. To fund the expansion, the brothers had come to a splendid agreement with a building contractor, Crop from Meulebeke. Fifty percent of the work would be paid for in cash and the other half ‘in natura’, in other words, in beer. Paul and Ernest brewed bottom-fermented beers: bock, export and pils. The changeover to the production of this type of beer took a great deal of money and effort but did not exactly set the tills ringing. At all times though, the brothers honoured their promise to ‘merke’ Louise, who asked of them: “As long as I live, there are two things you must not do: stop brewing or go bankrupt. But once I’m dead, you can do whatever you want.” Ernest remained a bachelor all his life. Paul married Germana Ampe and the marriage produced eight children. The plan was that Marc, one of the younger sons, would take over the brewery. However, father Paul contracted a serious illness at a relatively young age and the family feared for his life. One of the older sons, Luc (born 1930), seized his opportunity and started to study to become a brewer. During the holidays, the four sons would help out at the brewery, mainly sticking on labels. After one year at the brewery school Luc was fed up with the sticky stuff. He was allowed to join other breweries as a trainee to expand his knowledge. One of his main postings was with the Wicküler – Kupperbrauerei in Wuppertal in Germany, where he learnt that order, hygiene and discipline are essential ingredients for brewery management. Once Luc had finished his studies he was ready to take over at the family firm. 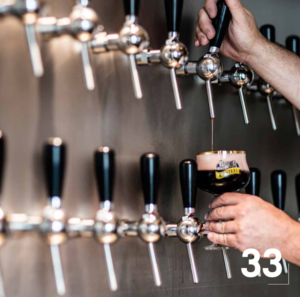 When, in 1953, Luc Van Honsebrouck took his first managerial steps at the Sint Jozef brewery, the range comprised brown table beer, export, pils and oud bruin, a regional beer from Western Flanders. Luc soon realised that his small family brewery wasn’t able to compete with the large pils breweries. He decided to concentrate on the production of an oud bruin, naming it Bacchus in 1954. Barely one year on, Luc decided to stop brewing pils and, for good measure, the Sint Jozef name was dropped for Van Honsebrouck. 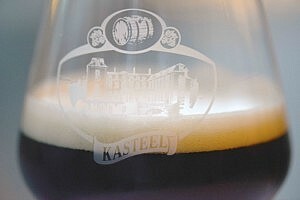 Luc did want to continue selling pils in his own cafés, so he concluded an exchange deal with the Eeklo-based Krüger brewery. They would offer Bacchus in their cafés and he would sell Krüger Pils in his. The Bacchus sold very well but the Krüger didn’t. Bacchus experienced its first real breakthrough around 1975, when demand for Rodenbach, a similar beer, exceeded the supply that its eponymous brewery could manage. Bacchus production was stepped up to 2,500,000 litres per annum. It is impossible for a brewery to survive on the production of just one beer. And when, in the early 1950s, Belle Vue Gueuze became popular, father Paul started distributing it. To start off, he purchased 20 crates, which turned into 50 and finally, 100. 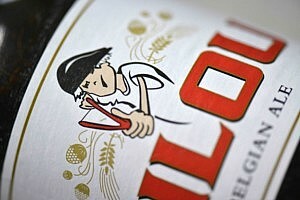 The success of this venture gave Luc the idea to create a second specialty beer. Bacchus was to be joined by a Van Honsebrouck gueuze. The ingredients and the brewing method did not pose any particular problems. But: how do you transfer the wild yeasts needed for spontaneous fermentation from the valley of the Zenne to Ingelmunster, which is about 100 kilometres away? The solution was simple: in 1957 Van Honsebrouck bought lambic wort from Van Haelen Frères in Uccle. In their cooling basin this wort had been permeated with the ambient microflora and, one day later, it was transported by road to Ingelmunster. There, the wort was pumped into the foeders used to mature the Bacchus and blended with wort from the brewery. Luc then transferred the yeast culture from one foeder to the next and thus, based on a relatively small quantity of wort purchased elsewhere, he managed to produce sufficient lambic to feed his own gueuze and kriek.